A research team at Keio University, led by Tomoharu Oka, has discovered intermediate-mass black hole (IMBH) candidates at the center of the Milky Way Galaxy, about 30,000 light-years our solar system in the direction of Sagittarius. IMBH candidates are considered to be the "seeds" that form and grow massive black holes. Using radio telescopes, the research team led by Associate Professor Oka has found four “warm, dense (more than 50 degrees Kelvin, more than 10,000 hydrogen molecules per cubic centimeter)” masses of molecular gas at the center of the Milky Way Galaxy. Three of those masses of molecular gas have been expanding. This research suggests that supernova explosions caused the expansion. It is estimated that the largest explosion that occurred in the masses of molecular gas is equivalent to 200 supernova explosions. On the other hand, the age of the gas masses is approximately 60,000 years old. It can be inferred that a huge star cluster (image above) is buried in one of the gas masses. The mass of the cluster (more than 100,000 times the mass of the sun) is comparable to the largest star cluster found in the Milky Way Galaxy. It is thought that IMBHs are formed within such huge star clusters. Eventually, IMBHs born near the center of the Milky Way Galaxy expand into a supermassive black hole at the nucleus of the galaxy. The team observed emission lines at wavelengths of 0.87 mm, emitted from carbon monoxide molecules in an area of several degrees that includes the center of the Milky Way Galaxy. The ASTE 10 m telescope in the Atacama Desert (4,800 meters above sea level) of Chile was used for observation. More than 250 hours in total were spent on the prolonged observation from 2005 to 2010. The team compared this observation data with data of emission lines at wavelengths of 2.6 mm, emitted from carbon monoxide molecules in the same area, which were obtained using the NRO 45m Telescope. When intensity values of emission lines at different wavelengths, emitted from carbon monoxide molecules, are compared, it is possible to estimate temperature and density of molecular gas. In this way, the research team succeeded in drawing detailed distribution maps of “warm, dense” molecular gas of more than 50 degrees Kelvin and more than 10,000 hydrogen molecules per cubic centimeter at the center of the Milky Way Galaxy for the first time ever. “The results are astonishing,” said Oka, the research leader.The “warm, dense” molecular gas in that area is concentrated in four clumps. It turns out that these four gas clumps are all moving at a speed of more than 100 km/s. Sgr A, one of the four gas clumps, contains “Sagittarius A*,” the nucleus of the Milky Way Galaxy. Oka added, “The remaining three gas clumps are objects we discovered for the very first time. It is thought that ‘Sagittarius A*’ is the location of a supermassive black hole that is approximately 4 million times the mass of the sun. It can be inferred that the gas clump ‘Sgr A’ has a disk-shaped structure with radius of 25 light-years and revolves around the supermassive black hole at a very fast speed.” *The team also found signs of expansion other than rotation in the remaining three gas clumps. This means that the gas clumps, have structures that were formed by supernova explosions that occurred within the gas clumps. The gas clump “L=+1.3°” has the largest amount of expansion energy. Its expanding energy is equivalent to 200 supernova explosions. The age of the gas masses is estimated as approximately 60,000 years old. Given that the energy source is the supernova explosions, the explosions have continued to occur every 300 years. The research team used the NRO 45m Telescope again to further examine the molecular gas's distribution, motion and composition to determine whether supernova explosions caused the expansion. “Observation clearly showed that the energy source of L=+1.3° is multiple supernova explosions. "We detected multiple expansion structures and molecules attributed to shock waves,” Oka said. 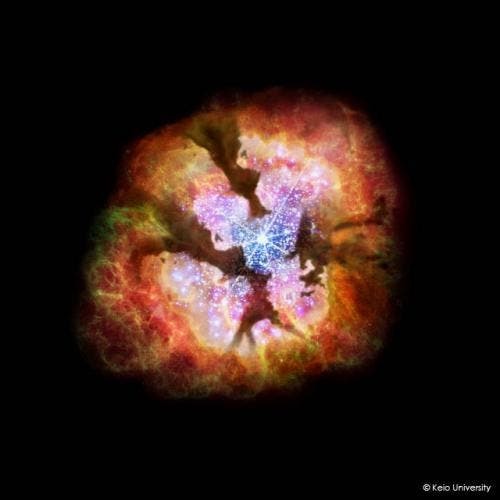 “Based on the observation of L=+1.3°, it is also natural to think that the expanding gas clumps L=–0.4° and L=–1.2° derived energy from multiple supernova explosions,” Oka added. A supernova explosion is a huge explosion that occurs when a star with more massive than eight to ten times the mass of the sun ends its life. Such a high occurrence of supernova explosions (once per 300 years) indicates that many young, massive stars are concentrated in the gas clumps. In other words, this mean that there is a massive “star cluster” in each gas clump. Based on the frequency of the supernova explosions, the team estimated the mass of the star cluster buried in L=+1.3°as more than 100,000 times the mass of the sun, which is equivalent to that of the largest star cluster found in the Milky Way Galaxy. The star cluster is huge, but it had not been discovered until now. “The solar system is located at the edge of the Milky Way Galaxy's disk, and is about 30,000 light-years away from the center of the Milky Way Galaxy. The huge amount of gas and dust lying between the solar system and the center of the Milky Way Galaxy prevent not only visible light, but also infrared light, from reaching the earth. Moreover, innumerable stars in the bulge and disc of the Milky Way Galaxy lie in the line of sight. Therefore, no matter how large the star cluster is, it is very difficult to directly see the star cluster at the center of the Milky Way Galaxy,” Oka explained. “Huge star clusters at the center of the Milky Way Galaxy have an important role related to formation and growth of the Milky Way Galaxy's nucleus,” said Oka. According to theoretical calculations, when the density of stars at the center of star clusters increases, the stars are merged together, one after another. It is expected that IMBHs with several hundred times the mass of the sun are formed. Eventually, these IMBHs and star clusters sink into the nucleus of the Milky Way Galaxy. The IMBHs and star clusters are then merged further, and form a massive black hole at the Milky Way Galaxy's nucleus. Alternatively, the IMBHs and star clusters could help expand an existing massive black hole. The supermassive black hole at “Sagittarius A*,” the nucleus of the Milky Way Galaxy, has also evolved through these processes. The new discovery is the “cradles” of IMBHs that become “seeds” of the supermassive black hole at the nucleus. “We would like to observe IMBHs in the star cluster. Actually, our observation data has already indicated traces of IMBHs,” Oka said. One of the newly discovered gas masses, “L=–0.4°,” contains two small gas clumps moving at a very fast speeds. 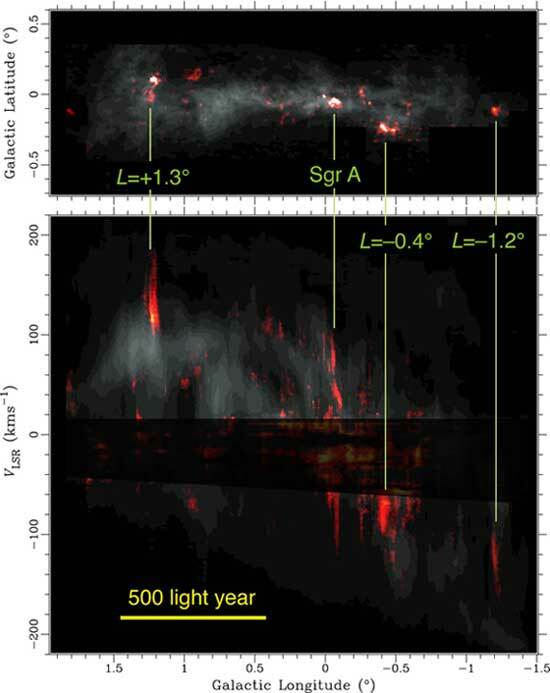 If it is confirmed that these small gas clumps are rotating, it can be inferred that there are “invisible huge masses” at the center of the gas clumps. These “invisible huge masses” are likely to be IMBHs hidden in the center of the star cluster. “In order to confirm the existence of IMBHs, we are planning to conduct further observations. The new discovery is an important step toward unraveling the formation and growth mechanism of the supermassive black hole at the Milky Way Galaxy's nucleus, which is a top-priority issue in galactic physics,” Oka concluded. These research findings have been published in Astrophysical Journal Supplement Series, vol.201, pp14-25, a professional American astrophysics journal. More information: (Note: 1) The NRO 45m Telescope at Nobeyama Radio Observatory, NAOJ (Nagano Prefecture) Journal reference: Astrophysical Journal.